If you are looking for timeless jewellery to compliment pretty much everything in your wardrobe, look no further than Ingle & Rhode. The Mayfair, London, based ethical jewellers presents an online offering including engagement, wedding and eternity rings, with bespoke designs available on request. But today, we are focusing on their silver collection. What is Fairmined sterling silver? 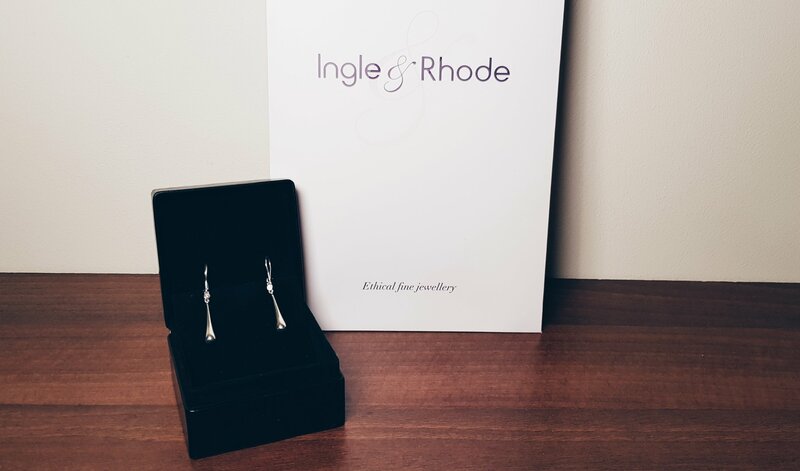 The entire Ingle & Rhode silver collection is crafted within the UK using Fairmined sterling silver. So, what is Fairmined silver? Fairmined is a gold standard assurance that the silver used to craft the jewellery is sourced from responsible small-scale mining companies. Companies that meet global standards for responsible sourcing. It is then shaped and finished by expert craftsman. However, when you purchase your jewellery, can you always be sure where it is sourced and that it is done so responsibly? 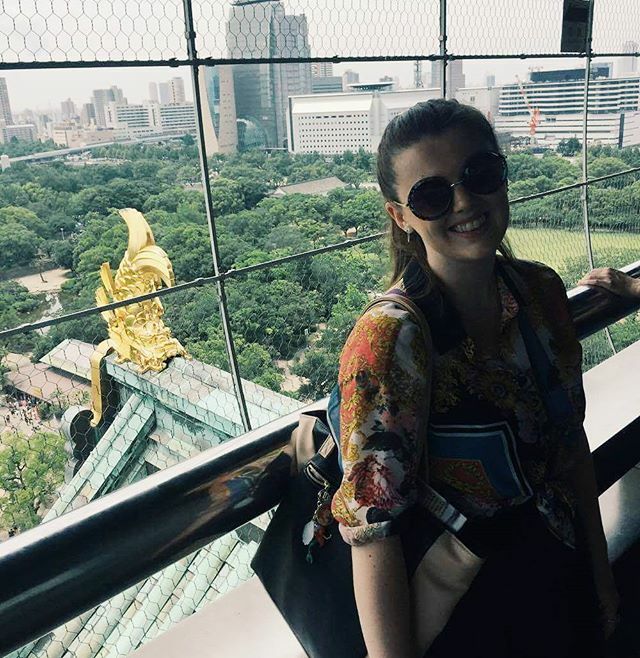 In the competitive jewellery industry, it is an unfortunate reality that environmental and human exploitation is abundant to keep prices down for mass production. Consumers are far more aware of these harsh realities and desire conflict-free and responsibly sourced items. With Ingle & Rhode jewellery, you can always ensure that this is the case. What did I think of the Droplet Earrings? I was lucky enough to get hold of the diamond Droplet Earrings. 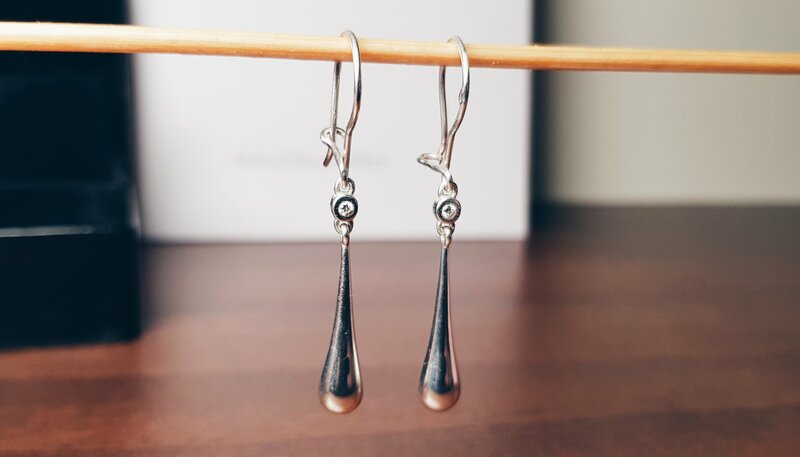 These elegant, beautiful and utterly timeless earrings are crafted from the aforementioned and celebrated Fairmined sterling silver. Each earring is then set with a Canadian diamond. 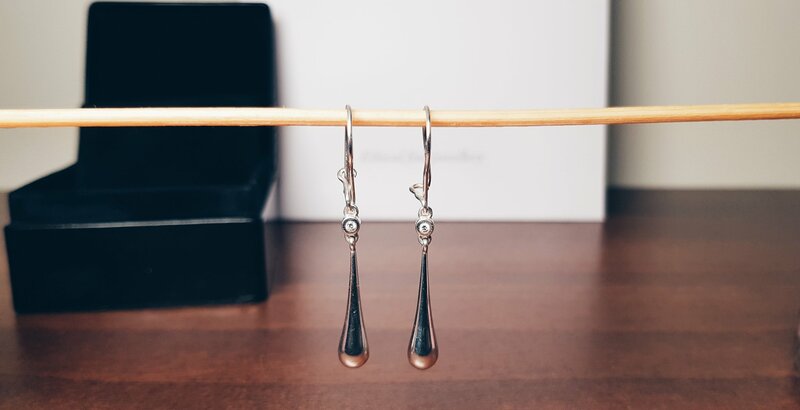 Each sophisticated earring measures 2.5 centimetres in length with a delicate droplet style and clasp reverse. They can be purchased alongside a matching Droplet Pendant. The majority of items within the silver collection (excluding the cufflinks) are adorned with Canadian diamonds. Diamonds that are beautifully crafted and ethically sourced. Canada is renowned for its diamonds. It is one of the few countries worldwide to excavate monitored and traceable diamonds. Meaning they are sourced, cut and polished responsibly. Thus, all diamonds used by Ingle & Rhode are traceable, fairly mined and certifiable, with Canadian environmental laws ensuring ethical practice and a thorough environmental conciousness. Once these diamonds have been sourced, mined areas are restored and wildlife is always protected. Most noteworthy, Canada produce 15 per cent of gem quality diamonds globally. 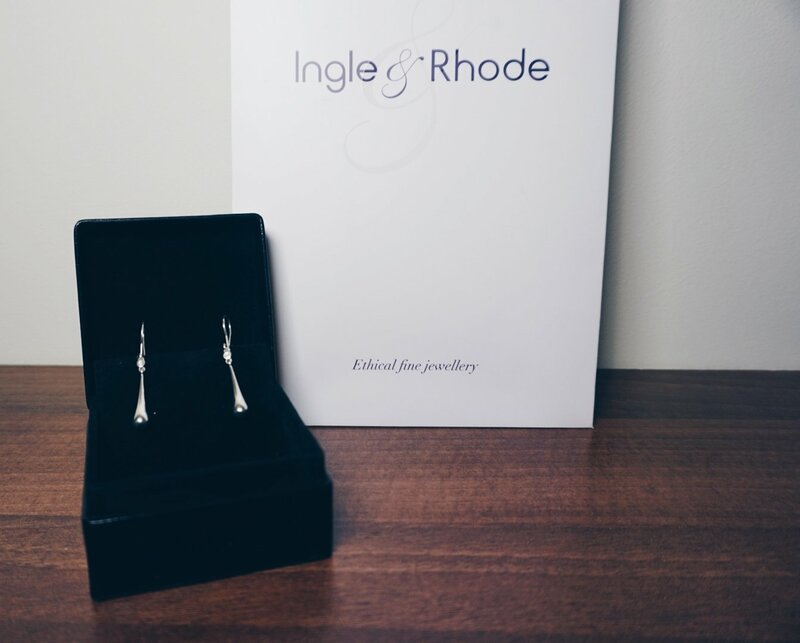 The Ingle & Rhode ethos ensures quality in the sourcing of their diamonds as standard, as well as being paired with their expertly crafted Fairmined sterling silver. In addition, they also other a bespoke engagement ring service, allowing you to design your engagement ring. There is an abundance of metal and gemstone options, as well as a variety of cut choices. This ensures complete customisation and perfection. For those looking for that special gift for someone special, or even as a treat for yourself, be sure to discover Ingle & Rhode’s luxury collections of Fairmined silver or gold and platinum jewellery crafted from Fairtrade or recycled precious metal. Either way, you are guaranteed to find a selection of stylish, ethical and environmentally concious jewellery. Jewellery to suit any occasion, budget and of course, you! Have you ever bought items from Ingle & Rhode? What is your favourite item in the silver collection?